Spring brings exciting bird migrations as the raptors, waterfowl, and smaller birds begin their long flight to and from Canada. Paradise becomes a busy place starting mid-March as the snow begins to melt and birds and Bird Watchers start to arrive. The spring migration lasts for about 2 months and is monitored at the Whitefish Point Bird Observatory. Photo opportunities are everywhere. 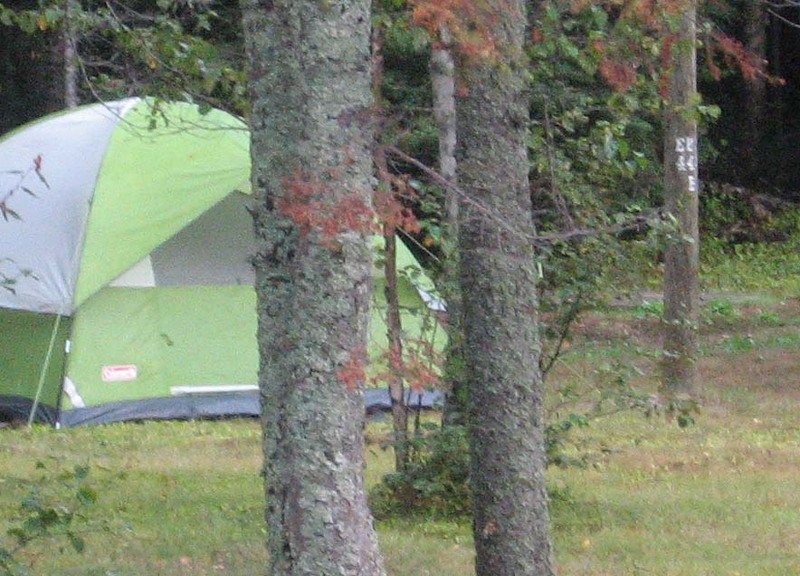 There are a number of nice facilities for camping: Andrus Lake State Forest Campground, Bodi Lake state Forest Campground, the Lower Tahquamenon Falls State Park Campground, the Mouth of Tahquamenon River State Park Campground , or the Mouth of the Two-Hearted River State Forest Campground.. 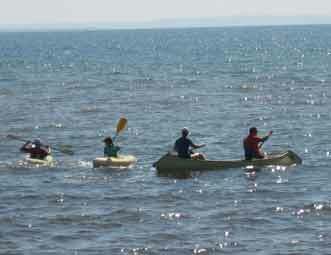 The Tahquamenon Falls State Park offers canoe and kayak rentals at the Mouth of the Tahquamenon. Canoe and kayak trips on the Tahquamenon River, 1 hour to multi-day trips available. 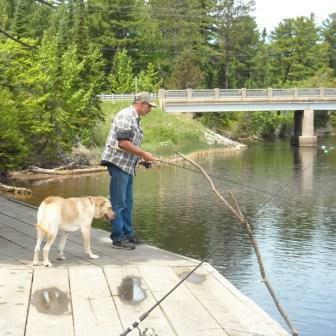 Deliveries to area campgrounds, including Tahquamenon Falls and Muskallonge Lake State Parks. Shuttle Service, Pets Welcome. Cross-Country skiing is so popular in the area that on Friday nights in February, the ski trail is lantern lit. Print out a copy of the snowmobile "Rules of the Road" to take with you. We make shirts, sweatshirts, hats for groups, special occasions -- discounts available. We also specialize in Paradise apparel. Located next to the Hardware. 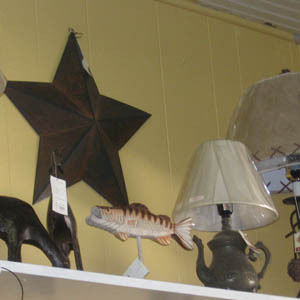 Open May 1 - October 31, 10am-6pm daily. Nautical prints	and apparel. Great Lakes Shipwreck Historical Society Admin Office	World-class museum at historic Whitefish Point, open May 1 through	October 31, 7 days per week. Crews Quarters Overnight Program	available. Have your picture taken with bear cubs! Tour #1 is 6 1/2 hour train and riverboat tour to the Tahquamenon Falls. 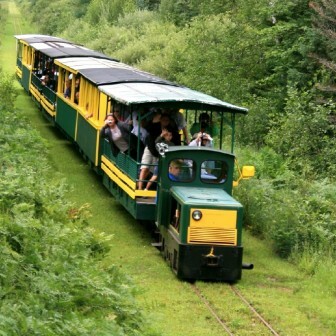 Tour #2 is a 1 3/4 hour Toonerville Trolley Wilderness Train Ride. Open mid-June through early October. Paradise, Michigan, a picturesque town 60 miles north of St. Ignace on Highway M-123, is a welcoming haven for snowmobilers, skiers, and all winter sport attractions. Paradise, Michigan, is the perfect spot for winter sports because it has an average of more than 200 inches of snow each year. The Paradise area also has more than 200 miles of painstakingly groomed and well-marked trails wending their way throughout the entire region. Once in Paradise, a winter sports enthusiast can travel in any direction and never use the same trail twice. 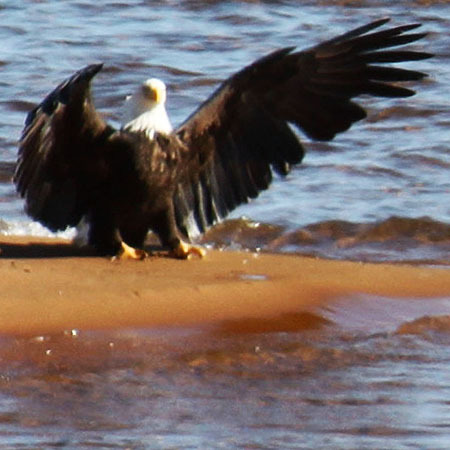 You can easily travel to Tahqauamenon Falls, Newberry, Whitefish Point and back again. Chippewa and Luce counties have worked very hard to make sure that the experience offered to snowmobilers is an unequaled opportunity to see first hand wilderness beauty. Along the many trails you will often run into welcoming faces in the small communities that lie along the trails. 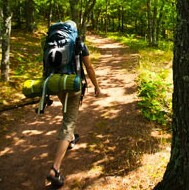 The Paradise area trail system connects to other trails that cross the entire Upper Peninsula. These interconnected trails can take you from the beauty of Tahquamenon Falls to the rugged shorelines of Lake Superior and Lake Michigan. After your picture perfect journey through the wilderness, the Paradise Area offers comfortable lodging and accommodations to get a bite to eat or simply warm up with a hot beverage. The local residents make you feel welcome all along the way, a type of hospitality that you will experience throughout the Upper Peninsula. If you start out traveling southwest from Paradise, you will soon come upon the Tahquamenon Falls State Park. The park is nearly 50,000 acres of wilderness beauty, 40 + miles of trails and is the home of the second largest waterfall east of the Mississippi. The park is open year-round and the winter scenes are ones you will treasure forever. With the snowfall and cold weather the park becomes a winter wonderland with snow and ice sculptures. Remember to pack your camera. Whitefish Point is located north of the town of Paradise on Whitefish Point Road. Whitefish Point is home of the Whitefish Point Lighthouse and the Great Lakes Shipwreck Museum. The lighthouse started its operation in 1849 and remains as the oldest working lighthouse on Lake Superior. Since 1849, the lighthouse has signaled a change in course for ore carriers and other ships navigation through dangerous and treacherous waters to and from the Soo Locks. We are certain that at the end of your winter visit here, you will walk away with wonderful memories that will last a lifetime. Once someone experiences what winter sports are like in the Paradise area, they come back again and again. So, remember, when planning your winter trip to our beautiful area, make your reservations early. You will want to be able to stay overnight to really enjoy everything Paradise has to offer in winter sports and recreation. Planning in advance is strongly urges so that you won't miss out on a thing. "Snowmobilers come for the Mardi-Gra-de-Snow in January, and two hundred fifty miles of groomed trails, said to be the finest in the state, plus hundreds of ungroomed trails for the adventurous. There have been snowmobilers having fun here from as far away as Maryland, Vermont, Kentucky, Virginia, Ohio, Indiana, Illinois, and Wisconsin. This area is called the "Snowmobile Capital of the U.P. " 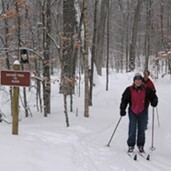 Paradise Pathway Cross-Country Ski Trail, off M123, makes two loops encompassing 6.3 miles of well-brushed and signed trail that is used both summer and winter, by skiers and hikers alike. Hundreds of miles of logging roads, which are not plowed in winter, are there for those who like to snowshoe. " Reflections on Paradise, 1989. For the best trails, utilize the trail map and be sure print out a copy of the snowmobile "Rules of the Road" to take with you.